I love listening to the great guitar players. David Gilmour, Jimmy Page, Jimi Hendrix and Billy Gibbons all thrill me with their mastery of chords and riffs. 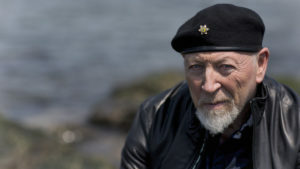 But one guitarist stands out amongst all others, that player being the peerless and inimitable Richard Thompson. Thompson is a player of unrestrained power, a genius of the fret who can make one guitar sound like an orchestra; but yet he is still able to retain an understanding of space, an effortless creation of unforced beauty. And if that wasn’t enough Thompson is also a song writer of great skill, worthy to be mentioned in the same breath as other contemporary’s that came to prominence in the white heat of 1960’s British music; the Lennon and McCartney’s, the Bowie’s, the Davies’ to name but a few. 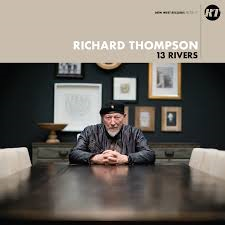 Released on the 14th September by http://proper-records.co.uk, Thompson’s new self produced album, 13 Rivers, is a mighty fine record that only enhances and confirms RT’s position in the pantheon of both guitar and song-writing greats. Having kept together a core rhythm section, Michael Jerome on drums and bassist Taras Prodaniuk, for some years now space is given to allow Richard’s trademark guitar sound to accompany his songs that feature his acerbic wit, tales of lost and unrequited love and stories of de’ering do. Accompanied by long term collaborators, guitarist Bobby Eichorn and harmonies supplied by Siobhan Mayer Kennedy, Judith Owens and Zara Phillips, this album comes over as a very personal release, particularly with Richard also taking production duties, one which, at this stage of his career, is just as Thompson wants it to be, for certain something that RT has not only earnt but also richly deserved. As for the songs for themselves the first thing to say is that, in common with the great albums Thompson has put out over the years, is that he has hit on a fabulous formula that works so very well. The albums all have a number of great songs, none added to fill up time, all fitting together to create a superbly well crafted collection. 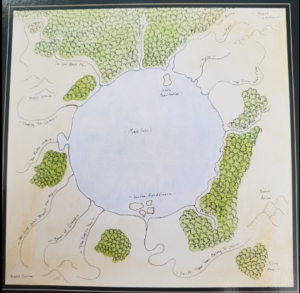 But, as the picture from the inside cover shows, they seemingly come from different places, have a number of influences, yet still end up at the same place such as the lake the 13 Rivers drain into? Or is it that they start from the same place and permeate out into the world. Either way the songs fit, complement and create to make what is a truly wonderful piece of work. Listening to the songs on 13 Rivers is both joyous and reflective; as a celebration of a song-writer and guitar player at the very, very top of his art but also as a look back over the years of the music and experiences that have led Thompson to be just plainly this bloody good. And this for me, is the real beauty of this album. There are so many nods to works he has made over the last 50 years and more importantly, perhaps, to those he has worked with. The eighth track, My Rock, My Rope, has sumptuous gaps in the guitar playing that get filled, in my head at least, with snatches of fiddle courtesy of the dearly missed Dave Swarbrick, other tracks have beautiful harmonies that take me back to the early 70’s music produced with Richard’s first wife Linda whilst all the while underpinned by those amazing guitar solo’s that first turned me onto Thompson’s work when discovering the Rumor And Sigh and Mirror Blue albums. But don’t get fooled into thinking this is just a retrospective, 13 Rivers is an outstanding album of fresh and original material and one which will stand up to be counted amongst other albums released this year by artists who should and probably do look to Richard Thompson as the barometer of what a guitarist and songwriter should be. If you like and are moved by great playing and great songs you must purchase 13 Rivers.